Wildwood head coach Dave Troiano, center, celebrates with his team after Wildwood defeated Haddon Township to win the South Jersey Group I championship. 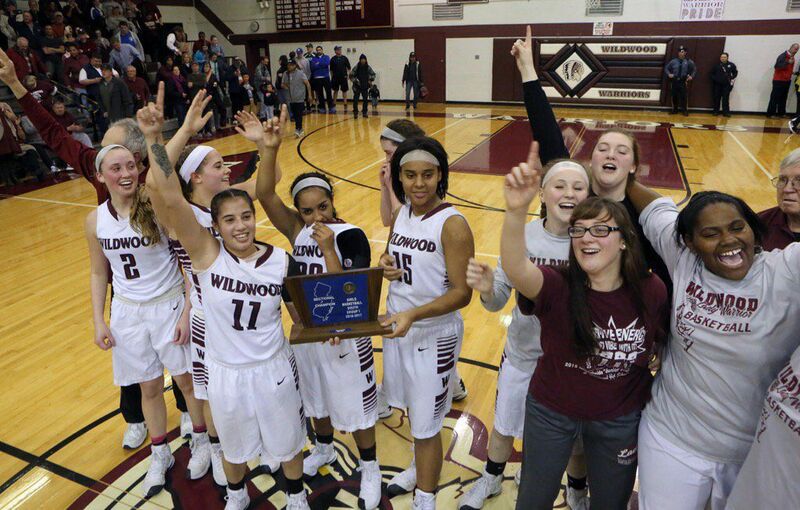 The Wildwood High School girls basketball team celebrates after winning the South Jersey Group I title. The Wildwood High School girls basketball team holds up the South Jersey Group I trophy. Troiano gets a hug from player Michelle Lugo after Wildwood defeated Haddon Township 42-31 to win the girls basketball South Jersey Group I final in March. Wildwood’s Maddie McCracken splits the defense of Haddon Township’s Grace Marshall and Erin Rust during Tuesday night’s South Jersey final. McCracken averages 16 points and four assists per game for the Warriors. Wildwood’s Mackenzie McCracken, left, and Haddon Township’s Madison Bradley get tangled up in the lane during Tuesday’s South Jersey Group I final in Wildwood. 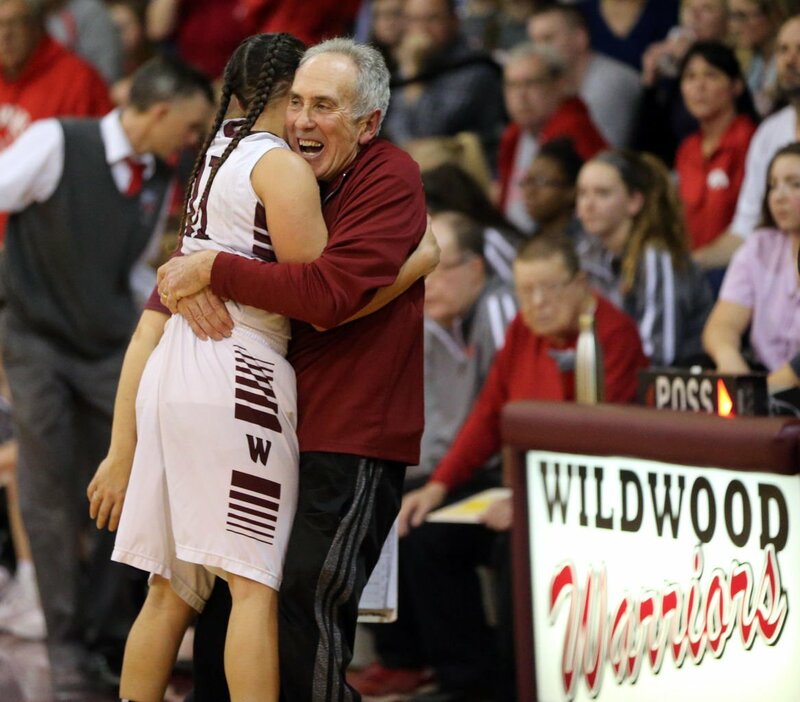 WILDWOOD — When the Wildwood High School girls basketball team faced Haddon Township in the quarterfinals of last season’s South Jersey Group I playoffs, the Warriors saw their opponents make nine 3-pointers on its way to an eight-point win. On Tuesday, with the stakes much higher, the Warriors made sure Haddon Township didn’t repeat that kind of long-distance shooting success. Wildwood forced Haddon Township to miss all 23 of its 3-point attempts and led nearly from start to finish in a 42-31 victory in the South Jersey Group I championship game. The Warriors advance to a state semifinal game against Central Jersey champion Bound Brook at 4 p.m. Thursday at Deptford Township High School. Bound Brook beat Shore Regional in the Central Jersey title game Tuesday. Wildwood senior forward Mackenzie McCracken scored a game-high 26 points, getting 16 of them in the second half. She also had 11 rebounds. “It’s been our goal, ever since Haddon Township beat us up there last year, to win South Jersey,” McCracken said. “We knew we had the tools to do it, and I felt like we were very well prepared going into this game.